Strategically located on the Strip, New York-New York Hotel & Casino can be easily spotted by its 150-ft high replica of the Statue of Liberty. It also houses a lavish casino, a 180-degree thrilling roller coaster, a number of well-furnished rooms, and a variety of international cuisines at its 11 on-site restaurants. These are some of the features that make New York-New York Hotel & Casino the accommodation of choice for both solo travellers as well as families and couples. Party hard at the hotel’s nightclub, catch a performance of Cirque du Soleil or simply revel in the boisterous joys of Las Vegas. New York-New York is indeed the perfect Vegas destination to enjoy the sheer madness of the Sin City. Strategically located on a posh area on the Strip between The Monte Carlo and Excalibur, this hotel is near all the casinos, bars and restaurants worth visiting in Las Vegas. It is 12-minute walk from the T-Mobile Arena and is situated at a distance of 13 km from Desert Pines Golf Club. The McCarran International Airport is just a 10-minute drive from the hotel. 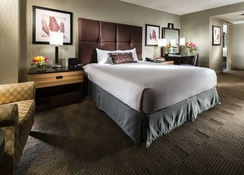 New York-New York Hotel & Casino has 2,024 sophisticated rooms and 104 well-appointed suites, which feature marble bathrooms, desks with wireless and high-speed internet, flat-screen TV sets, in-room safes, luxurious mattresses, linens and upholsteries. 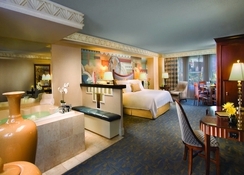 Suites feature whirlpool tubs, mini refrigerators and Bose stereo systems. The categories of rooms are named after prominent places, buildings and streets in New York: Madison Avenue Queen, Park Avenue Queen View, Park Avenue King View, Penthouse and so on. There is round-the-clock room service for all categories of room. 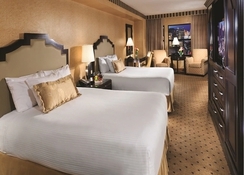 New York-New York Hotel & Casino has 11 on-site fine dining restaurants. Enjoy a range of cuisines from the Asia, America, Italy and Mexico at the hotel’s legendary eating joints such as Tom’s Urban, Gallagher’s Steakhouse, Nine Fine Irishmen, Il Fornaio, American Dine, New York Pizzeria, Breakfast at The Big Apple, Broadway Burger Bar & Grill, and Chin Chin Cafe & Sushi Bar. Relish authentic homemade pasta, wood-fired pizza, rotisserie chicken and duck, hearty steaks and chops, mesquite grilled fish and the seasonal soups and salads at Il Fornaio, the hotel’s award-winning pizzeria. The Las Vegas Strip is a great choice for travellers interested in shopping, nightlife and entertainment. The unique live entertainment options at New York-New York include Cirque du Soleil’s Zumanity – a show which never fails to dazzle the audience with its seductive twist on the reality. Hotel guests can also enjoy an outdoor swimming pool with hot tubs and private cabanas. There is also a fitness centre and a full-service spa.